GAZA CITY, Gaza Strip (AP) — Hundreds, including Hamas chief Ismail Haniyeh, attended the funeral of a well-known Palestinian journalist in Gaza on Saturday who was killed while covering mass protests along the Israeli border the previous day. Yasser Murtaja died from a gunshot wound he sustained while filming Friday in an area engulfed in thick black smoke from protesters setting tires on fire. Israeli troops opened fire from across the border, killing at least nine Palestinians and wounding 491 others in the second mass border protest in eight days. The deaths brought to at least 31 the number of Palestinians killed by Israeli fire since last week. Murtaja was over 100 meters (yards) from the border, wearing a flak jacket marked "press" and holding his camera when he was shot in an exposed area just below the armpit. The Israeli military has said it fired only at "instigators" involved in attacks on soldiers. It said it was investigating the circumstances of Murtaja's death. Hamas, which has ruled Gaza since a 2007 takeover and calls for Israel's destruction, has called for a series of protests until May 15, the anniversary of Israel's founding when Palestinians commemorate their mass uprooting during the 1948 war over Israel's creation. The Islamic group hopes the mass protests can create pressure to break a border blockade enforced by Israel and Egypt since 2007, without having to succumb to demands that it disarm. The blockade has made it increasingly difficult for Hamas to govern. It has also devastated Gaza's economy, made it virtually impossible for people to enter and exit the territory, and left residents with just a few hours of electricity a day. Murtaja, 30, was the co-founder of Ain media, a local TV production company that has done projects, including aerial drone video, for foreign media clients such as BBC and Al Jazeera English. Murtaja was not affiliated with Hamas or any other militant group. His death, along with the other recent casualties, seemed likely to draw renewed criticism from rights groups that have branded Israel's open-fire orders on the border as unlawful, after Israel's defense minister warned that those approaching the fence were risking their lives. Just two weeks ago, Murtaja posted a drone photo of Gaza's seaport at sunset on his Facebook page with the following caption: "I wished I could take this photo from the sky, not from land. My name is Yasser Murtaja, I am 30 years old. I live in Gaza City. I have never traveled." Friends say it reflected his greatest wish — to escape Gaza's isolation. "We didn't know his political views, he was passionate about his job and wanted to travel and learn," she said of Murtaja, who was the father of a 2-year-old boy. 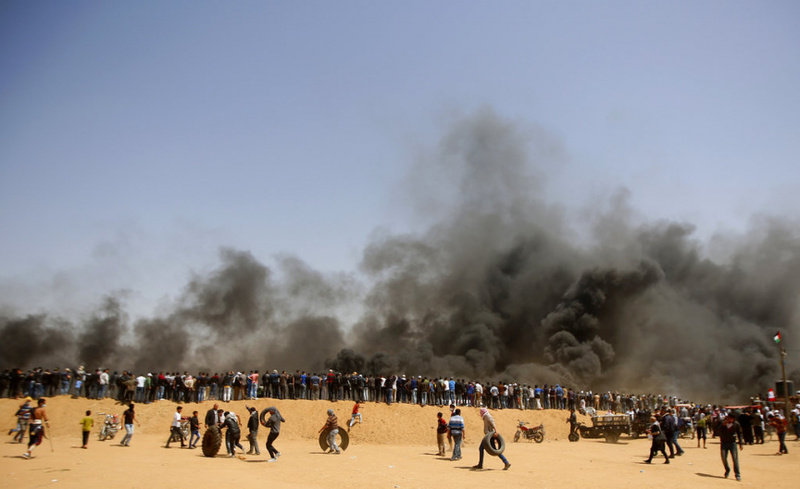 Witnesses described the area in which he was shot as a chaotic scene in which protesters torched large piles of tires, engulfing the area in black smoke that was meant to shield them from Israeli snipers. Footage showed that visibility was limited and the faces of some of the activists were covered in black soot. Israeli troops on the other side of the fence responded with tear gas, rubber-coated steel pellets and water cannons, as well as occasional live fire.